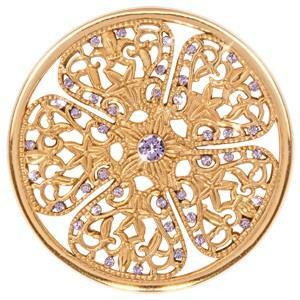 This yellow gold nano-plated 'Flower Fantasy' coin features a large elaborately carved flower with accents of purple sparkling swarovski crystals. Perfect for adding both sunshine and colour to your set. This is a large 43mm coin designed to fit in the 45mm pendant.